Olympic champions Helen Glover and Heather Stanning powered to victory in the women's pair at the British rowing trials at Caversham. The duo, racing competitively together for the first time since their London 2012 success, built up a sizeable lead before easing off in the final 500m. Polly Swann, who won world gold with Glover last year, and Jess Eddie were second in cold but sunny conditions. Olympic champion Alex Gregory and Mo Sbihi won the men's pair. The trials saw rowers compete against each other individually or in pairs over 2,000m at the team's Caversham base in a bid to impress selectors before the squad for the European Championships in Belgrade is named on 14 May. Before the trials, GB chief coach Paul Thompson decided to break up the Glover-Swann partnership and reunite the former with Stanning, who returned to rowing in December after a year with the army, which included a six-month stint in Afghanistan. That decision was vindicated as the Olympic champions moved five seconds clear of Swann and Eddie after 1500m before dropping the pace and edging across the line in a time of seven minutes 56.08 seconds, 1.14 secs clear. "They were tough conditions out there," Glover, 29, told BBC Sport. "We gave a bit away in the second half of the race but when you have the lead, all have to do is not make mistakes. We didn't push too hard to the line - it was more about securing the win today." Stanning, who finished 22nd in the winter trials in December, delivered a particularly impressive performance considering the short amount of time the 27-year-old has spent in a boat since winning gold in London. 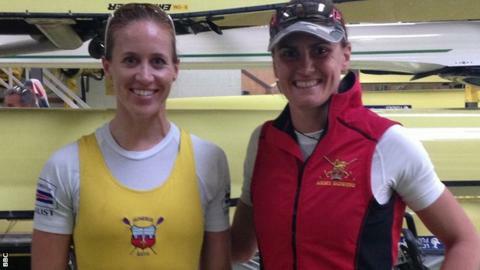 "It was brilliant to be back racing with Helen," said Stanning. "It feels like old times, but at the same time it's so refreshing because we've both learnt new things while we've been apart." Thompson and GB performance director Sir David Tanner will analyse the data from the trials and then decide whether to do more seat racing in training before naming the squad for the European Championships, which start on 28 May. The men's pair was a tensely fought contest, with Gregory and Sbihi edging a race-long battle with Andy Triggs Hodge and George Nash by 0.82 seconds. "Going to the line, it was a real push," said Gregory, who scored his second win at trials following success in 2009. "I could feel Mo had loads left in him, so it was just about calling him to go at the right time. It's the perfect way to start the season and it signals the end of the winter, which honestly was pretty miserable - it always is." Charles Cousins defended his title in the men's single, with Graeme Thomas taking second and Peter Lambert third. Alan Campbell finished third but was disqualified for arriving at the start late and then false starting, which resulted in two yellow cards. Vicky Thornley won the women's single, with Fran Houghton, who won the winter trials, second and Beth Rodford third. In the lightweight events, Olympic champion Kat Copeland, who won gold with the now-retired Sophie Hosking in the double sculls, marked her return competitive racing with a dominant victory in the single, beating Imogen Walsh by six seconds. Copeland said: "It was really good to be back racing again and in some ways a bit of a relief. I found this quite tough mentally last year after London 2012 and I was nervous ahead of the race, but I actually really enjoyed it. "There was some really good racing and a lot of good girls in the team, so there's a great opportunity to put a new double together." In the men's equivalent, James Kirwood won ahead of Will Fletcher and Peter Chambers.